It gives you a reason to write! Spoiler alert- the last one on that list is my favourite. Hey guess what? This post comes with a freebie that will get your writing juices flowing, big time. I work with a lot of people who see the value in blogging for their business, but just can’t make it happen. Some are overflowing with content ideas, to the point where it becomes overwhelming, or where they blog about everything and anything but their writing isn’t aligned to their communications or broader business goals. Others simply can’t find anything to write about, which can happen when we’re too close to something. Some of these clients work with me on a content blast to get their content plan created, whilst others simply handball their content marketing to me. Either way, they have a content plan and are putting blog posts out into the world to tell their story and to grow their business. So, how does one go from having ideas scribbled on post its- or from no ideas, zero, nada, zilch- to a full content plan? I’m so glad you asked! It all happens with some good old fashioned Word Nerd sorcery and some basic organisation skills. Shall we dive right in? Let’s start with a bucketful of ideas. There’s two approaches to generate ideas; the first is a wild brainstorm using great prompts like these, and the second is to brainstorm slightly less wildly against your content themes or pillars. Your content pillars will guide your plan and should be complementary to your broader business goals, as well as your communications goals. Is your reason for blogging to share your expertise? Then this will inform your pillar- for example, I have two content pillars within my plan that share my knowledge and experience- Communications Toolkit and Writing for Business. They share very specific information and tips and tricks against those two categories. Once your bucket is overflowing, sort each individual idea into categories. Some will be obvious- for example, if you’re in the business of counselling women leaders, and you have an idea for a post about equal pay, then you would allocate this to a category that focuses on gender issues. Back to my schedule- each year, I have four pillars in my strategy. 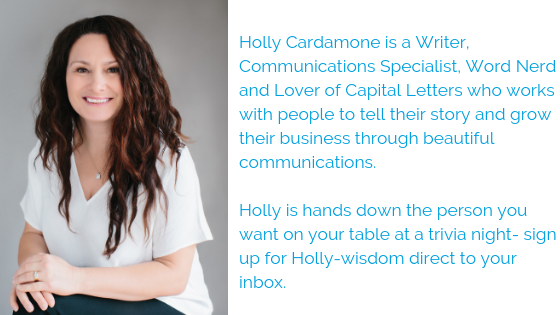 In 2019 I have Communications Toolkit, Writing for Business, Tell Your Story and Holly’s Story and all of my blog post ideas fit one of these categories. Once allocated into a theme, it’s time to decide on your blogging frequency. I blog weekly because maths hurt my head and it’s easy for me to allocate my topics out that way 😉 but monthly is absolutely a-ok too. Regardless of your theme, now all is left to do is to schedule each post across your calendar. Now, off you go and write! Or outsource of course; that’s always a good idea, and I know the perfect Word Nerd. Spoiler alert (again)- it’s me. 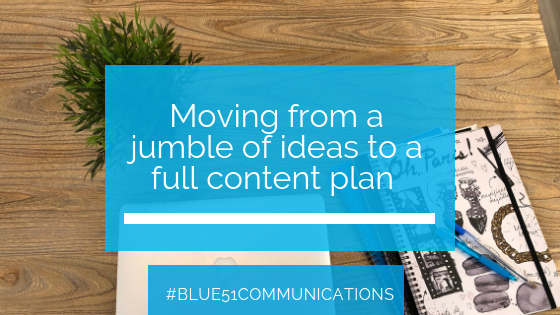 Tell me, do you have a content plan that you’re besotted with?